Windows users have several options when it comes to launching applications or opening files on their system. From placing programs in the system's taskbar, on the desktop or start menu, to using the start menu or browsing to the location on the hard drive manually. The main idea behind application launchers is to speed up that process. Ideally, all you have to do is enter what you are looking for in the program's interface to load it right from there. Most launcher apps come with shortcuts that you can press or active to display the frontend on the screen to start issuing your commands. While most launchers support the basic operations listed above, it is extra features that distinguish them mostly. Some may support web searches for example or to run Windows commands to quickly shutdown the PC. The following guide looks at the top program launchers for the Windows operating system. Here are the requirements that each launcher has to meet. A free version of the program needs to be available. It needs to be compatible with all supported versions of the Windows operating system. Not a docking type of application such as Rocket Dock. Below you find listed information about each program that made the best of list. Here you find a short summary of a program's functionality as well as a screenshot and link to the homepage where you can download it. After that you find a comparison table that you can use to compare programs in several ways, and last but not least recommendations. Blaze is an open source keyword launcher that you can use to load programs and files on your system, and to perform web-related activities such as searches. It uses a plugin-system that extends its functionality. Plugins are available to send emails, make calculations or index music files by their ID3 tags. You can add and remove directories to index in the settings of the application. For each directory, you can select whether you want its file contents and music file tags to be indexed as well. This makes Blaze interesting if you want to launch specific songs of your music collection using it. Executor comes as a portable version that you can download and run right away. The free program is very versatile when it comes to the functionality it offers. It can be used to launch programs and shortcuts, open files or folders, and to load websites or run Internet searches right from its interface. Its feature set does not end here though, as you find several tools integrated into the application as well. This includes an alarm clock and timer, an option to send emails, or to run select Windows commands such as shutdown or muting the sound. The program is very responsive and the settings it makes available are massive. From modifying hotkeys to creating your own commands it leaves no wish unfilled. Famulus does not ship with any commands which means that you need to add your own to launch specific files or folders using it. Since it does not scan locations such as the start menu, it means that you have to add all the programs and files to it that you want to launch using it. That's a big nuisance and makes it unusable for you if you want to use it to launch all installed programs on the system. When it comes to customizations, FARR takes the crown. While it works fine out of the box, it is a godsend for users who like to customize programs to their liking. You can modify nearly every aspect of the program, from basic information such as folders you want included in searches to advanced stuff such as heuristic scores and an impressive range of display related changes. 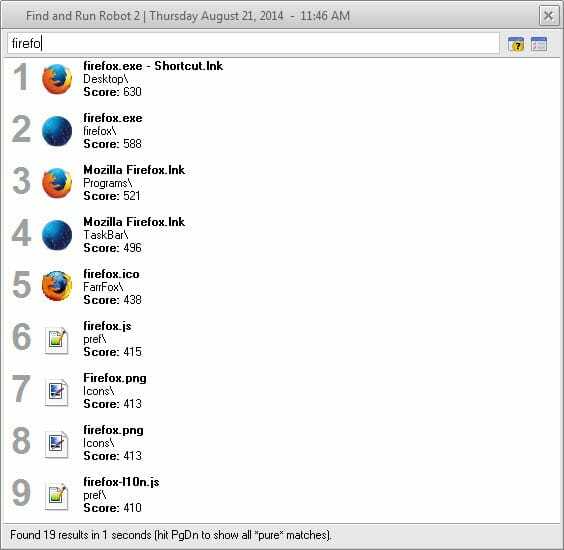 Find and Run Robot can be used to launch files and programs, to open folders on the system, launch web searches, or Windows tools. Its plugin system extends the functionality further and there are lots of them. From Gmail and Yahoo Mail plugins over a spelling plugin to plugins that add more search engines to the application. 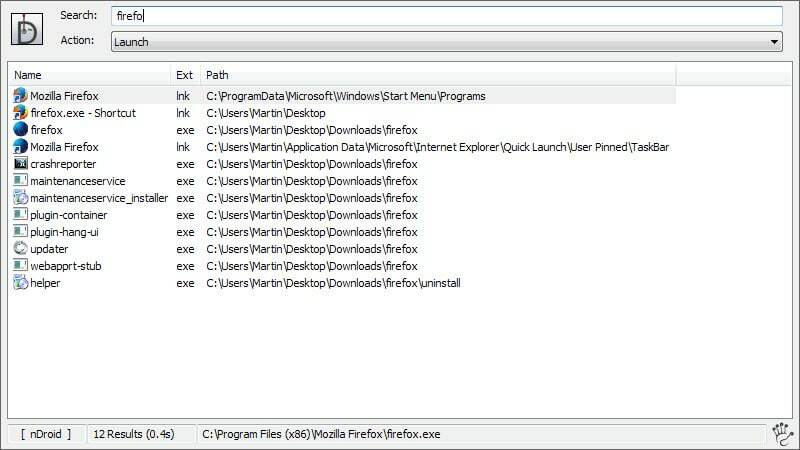 You can use Key Launch to run executable files stored in default or custom directories, and to perform web searches. The program itself is easy to use and supports the creation of aliases which help you run select programs faster. You can assign W to Microsoft Word for instance so that you only need to type W and hit enter to start the program. 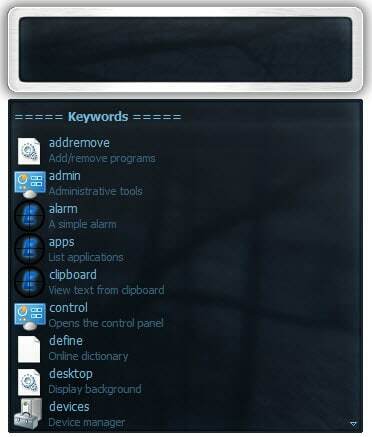 Launchy is a cross-platform keystroke launcher that is without doubt one of the most popular programs of its kind. It can be used to launch programs and files on the Windows system, perform various Web related tasks such as searches, and run commands and control panel tools. It needs to index the various locations it supports by default or that you add before they become available. Indexing is fast on the other hand and should not get into the way at all. The program is very responsive and fast, and supports a plugin system to extend its functionality further. The program is abandoned but works fine on modern systems. It scans select directories such as the Desktop and Start Menu automatically to make available select file extensions to the user when the application is being used. You can edit the file extensions that you want the program to crawl, and can also block particular files from being indexed at the same time. The program is rather bare bones part from this though. The interface of the launcher is as minimalistic as it can get. While some users may dislike that, others may like it because it is compact and still offers all functionality one would expect from an application of its type. The program can be used to launch programs and perform Web-related operations such as searching on the Internet or opening a website you are interested in. Most of the functionality is powered by what it calls Magic Words, keywords that run a specific command. The Magic Word dos will launch a command prompt window for instance, while google TEST a search for test on Google. The program that works really well out of the box is Executor. It supports a wide variety of options in regards to what you can launch using it. While that is the case, it is Find and Run Robot that gets my seal of approval. It provides the largest amount of customization options in all tested programs without sacrificing speed or memory for it. While it is not the smallest in terms of memory footprint, its less than 10 Megabyte should not be a problem on most systems. Now You: Prefer another keyword launcher or use one that is not listed here? Share it with everyone in the comment section below. Keyword launchers allow you to launch programs fast when you use Windows. Find out which launcher is the best for your needs. Now You: Prefer another keyboard launcher or use one that is not listed here? Share it with everyone in the comment section below. Did you mean instead of keyboard launcher: Keyword launcher? Yes that is right, corrected. Thanks! You could also have listed “Search Everything” which also has a quick launch keyboard shortcut and upon writing an executable name, you can press on the Enter key to launch it. In addition of being one of the best desktop search program, that makes it also a venerable keyboard launcher. Everything is a great program, have to agree. I’m using Launchy since years. There is simply no easier way to start a program. The program name completion is blazing fast. Listary is just the best ! Finds all you want. It IS the King ! Especially for files opening ! 100% agreement about the capabilities of Listary. Been using it for years. Columbus is a resourse friendly program built using Auto Hot Key, I have used Executer for long time, only drawback it has is that it becomes unresponsive after long time. I have chosen ` as Columbus launcher, and ctrl+ ` as program switcher. Thanks for the write up Martin! As the author of Find and Run Robot, I’m delighted to see it recommended. If anyone has suggestions or questions about the program, don’t hesitate to ask on the DonationCoder forum. There are also some videos of FARR in action on the page Martin links to if you want to see the program in action. Great article! You always hit on stuff I play around wih on my free time. I ended up going with Executor. It’s fantastic! There is only one thing I can’t seem to find in these programs. I’d like an autocomplete function. Like if I’m on a website and need to fill my email out, on my iPhone I use @@ and it shortcuts by filling out my email. I would love if any of these programs would utilize that as an option, but I understand it would probably be difficult to implement. I love what they can do already! Bean, if you’re familiar with Autohotkey, it is excellent for creating auto-completions. I have a script with tons of them, and it’s easy to add more, or to personalize. It would be very easy to create a line that turns @@ into your email address. For mine, I type em1, em2, or em3 to have it type out my various email addresses. Autohotkey is really powerful and well worth learning if you’re a power user. Martin, you have Blaze listed in the comparison table as not having a portable version, yet I went to it’s download page and did find a portable version. Also, in the future it might be worth noting whether the app is still under active development. Some of these, like Blaze and Launchy, are long dead projects — although still useful. Thanks for a great post, martin! Blaze requires the .NET Framework, that’s why I did not list it as portable. I have used “Hot Chime” for a long time. You can create your own abbreviation for any file, program or website. A hot key calls up Hot Chime and then you type in any abbreviation and hit enter. Would like your opinion and those of others as to how it compares. In any case thanks for your list of alternatives. google desktop was the first this kind of app that i used on xp. for now inbuilt windows 7 start menu is enough for me. Yeah, I use Launchy + Everything. I personally prefer FARR. Very powerful and can do more than just launch apps. One can customize it to be as specific or multifunctional as one wants. I prefer to use keyboard shortcuts from start menu every program when you right click goto properties in shortcut tab we can associate shortcut keys for any program. I installed FARR, Launchy and Slick Run. All of these programs have exceedingly tiny fonts, either in their primary user interface, the options box or both. And when I say tiny, in some cases, it’s really ridiculously tiny, and/or made out of a single line of pixels. Is there any way to correct this ? I run all the time into this problem, often with otherwise remarkable programs that I’m therefore unable to use. From what I understand, it’s due to them not being “high DPI-aware”. My second question would be : how do other people manage to use those programs nonetheless ? How do the developers of those programs manage to use them ? My eyesight is not that bad, and my display is very standard and not high DPI at all : it’s a 24″ desktop monitor with a 1920 x 1200 resolution, and Windows 7 display set at 150 % (because at 100 %, the UI is plain impossible to read). Some programs do scale smoothly with Windows display settings, and have very well designed user interfaces which are easy to read (the PDF X-Change series comes to my mind). How do you manage to use those badly-behaved programs, Martin ? I’d be eager to know. I don’t have these issues. I just checked Slick Run on a Windows 10 PC connected to a Full HD monitor and it looked just fine. The display was set to 125% scaling though. What happens if you change the scaling to 125%? Wow ! That was fast ! Exactly the same thing happens at 125 % with Slick Run. And at 100 %. I’ve just tried it. Slick Run has this nice option, by which you can adjust the font size of the main interface, that is the field where you type the name of the program you want to launch. However, in order to make that adjustment, you have to right-click on the main interface, click Setup, and that’s when you get that impossibly small-fonted option box, called Customize Slick Run. And you need to work there often, since that’s where you setup the “magic words” that will call up your programs. The font size of that options box does not scale with the Windows 7 display settings : it stays at its 100 % size (which means : impossibly small on a very standard 24″, 1920 x 1200 screen). Unless you untick the Use Windows XP style DPI Scaling box [Control Panel / Display / Set Custom Text Size (DPI)], but then, the option box will be blurry (and the main interface too). So you have the choice between a blurry user interface, and an impossibly small user interface : Slick Run is not high DPI-aware. Do you get a different result in Windows 10 ? Note the first article dates back from 2011, whereas the third one is from last year. Looks quite alright to me, if it’s not blurry to you. Also, I notice that the Use Windows XP style DPI Scaling option isn’t there anymore in Windows 10 Custom Sizing Options. However, Windows 10 is out of the question for me, for all the usual reasons. Besides, high SPI scaling is still a problem in Windows 10, according to Paul Thurrott and many of his commenters. I guess I’ll have to decide between blurry and small… when that option is available, which might not always be the case. One could make SlickRun portable, and I run it off a USB drive. An initial install is needed to get the files, and then you can copy the folder off, create a file named slickrun.local to the directory, and you’re good to go. You can uninstall, if you want.